Being a 28-year-old AHL player in the New Jersey Devils organization requires great patience, especially when your last name is Gionta. That virtue finally is paying off for Stephen Gionta, who after six seasons with their American Hockey League team has contributed to the Devils' run to the Eastern Conference Finals against the New York Rangers. Described as undersized, undrafted and an underdog, Gionta tried to be undaunted when he got his first shot in New Jersey last season. But in a 12-game NHL run he failed to register a point, and in his last game, a Dec. 4, 2010 loss in Philadelphia, he played only five shifts before being sent back to Albany. Entering this season, Gionta was looking for another shot. "Every year you hope it's going to happen. You work hard over the summer and try to earn a spot. 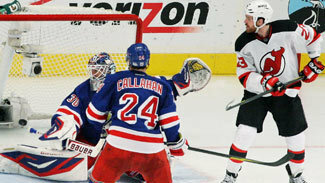 If it doesn’t happen, you just have to keep working hard and hope you get that break," Gionta told NHL.com. "It takes a lot to get to this level. You need the right timing and the right personality. Luckily enough, management gave me a shot coming into the playoffs." It took the entire season, but the speedy forward finally got that shot -- in the Devils' final regular-season game, against Ottawa. That day, after scoring his first NHL goal -- the eventual game-winner -- Gionta's second chance in the NHL already was looking better than the first. With 14 games played this postseason, Gionta has skated in more Stanley Cup Playoff games than regular-season games. He has two goals, two assists, and a plus-4 rating in 14 games on the team's fourth line, playing mostly alongside Ryan Carter and Steve Bernier, two other players who started the season under difficult circumstances. In the fall, while Gionta was starting another AHL season, Carter was waived by the Florida Panthers and Bernier signed with New Jersey's farm team, his fifth club in five years. After finding a new lease with the Devils, the unit has provided energy and some offense, including Carter's game-tying goal in Game 2 against the Rangers. "We just try to go out there and work hard," Gionta said. "I try to create stuff down low and hopefully get some bounces to contribute." The path to the conference finals has been unique for Gionta, especially with a team on which his older brother casts a long shadow -- even if he is only 5-foot-7. In seven seasons with the Devils before signing with Montreal, Brian Gionta won a Stanley Cup and established a franchise record with 48 goals in the 2005-06 season. Before that, Brian starred at Boston College, captaining the team to the 2001 NCAA championship. By the time Stephen arrived at BC in 2002, the Gionta name already was legendary. "We had seven sets of brothers over the last 10-12 years. It hasn't been a rivalry, more just wanting to add to the family name," said Jerry York, who coached both Giontas at BC. "The story is really about the family. It's remarkable. We had Brian for four straight years, then Stephen for the next four years. Their parents came to every single game, driving six hours and right back afterwards for six hours. I just can't imagine." Despite following Brian at BC and in New Jersey, Stephen Gionta said he's never felt any added pressure. "We're different styles of player," he said. "I don't think there's ever any pressure coming up behind him at all. And he never put any pressure on [me]. I talk to him regularly, almost on a daily basis. Just seeing how the family is doing." For one Devils veteran who has played with both Giontas, the similarities and differences are readily apparent. "They look alike," Devils goaltender Martin Brodeur said. "He [Stephen] has been tremendous. He's doing a hell of a job for us. He puts a lot of speed in the middle of our fourth line." "Watching Stephen play, he's getting better and better," York said. "After four, five years in the AHL, if you don't make it you have to think about a career in business or education. But now he looks like he belongs."